stitched on Chocolate Orange from Craft Kitten. 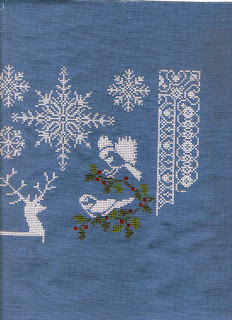 I made No Xs on this Just Nan design so that totally counts for No Xs November! 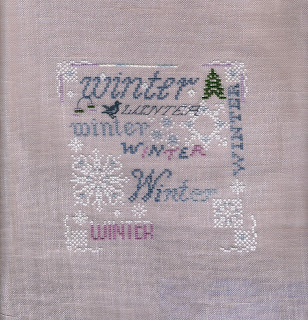 Winter Typography - No Xs done on this one. And that seems to be it for No Xs November! 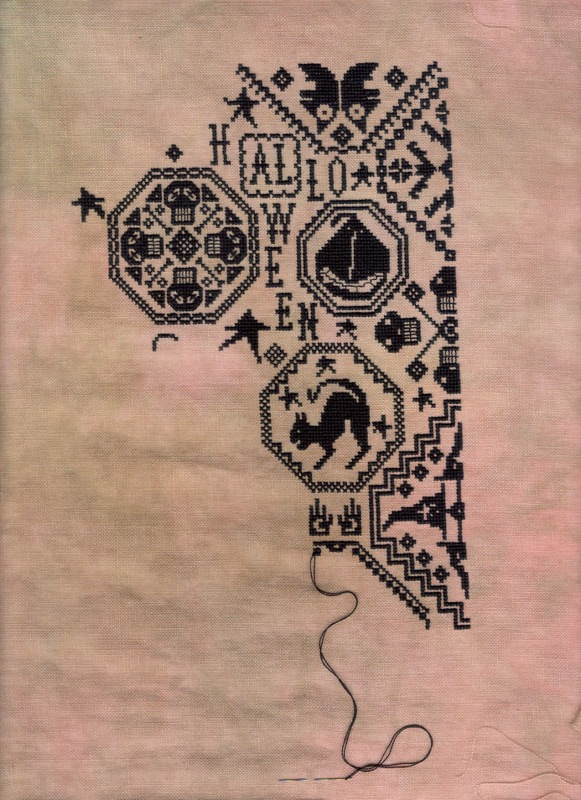 I did set some themes of my own for next year, for the Hallowe'en Ornie SAL Blog. You can find them here. 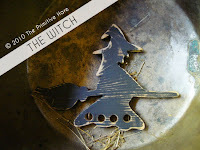 A mixture of traditional choices (Black Cats, Witches etc) as well as some new suggestions. Creepy Trees being one of my favourite new ones. Finally, we now have over twenty people signed up for Gifted Gorgeousness SAL next year. Everyone seems to be very excited about showing their appreciation to their fellow bloggers via the medium of "Stitching and Blogging About It". 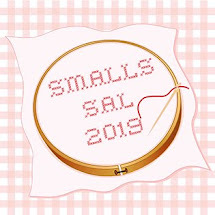 This is an informal SAL, there will be a Linky Post on the 15th of every month, just blog and link up in any month that you have stitched on some Gifted Gorgeousness. WIP photos more than welcome. THIS POST CONTAINS A SPIDER!!!! Primitive Hare Spooky Countdown - one per week starting 31st January - finished! I have made a decision about finishing this series. I bought a small scrapbook which has exactly the right number of pages to mount these designs. I bought some great scrapbook papers yesterday and will spend some happy hours cutting and sticking over the next few weeks. 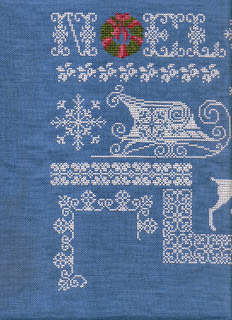 The cover will be the design found in JCS this month of Miss Santa. Speaking of JCS, they are a little bit cheeky about their renewals. My subscription expires with the Mar/Apr issue. So far I have received one written request to renew and one email. Excuse me, it's still four months until I need to renew! I wish they would let me pay by Direct Debit like the UK magazines do instead of a year in advance in one go. I have had a great response to the Gifted Gorgeousness SAL. 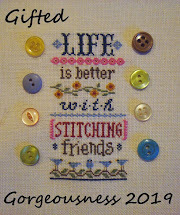 Twenty stitchers including me have signed up already. It's a very easy-going SAL. 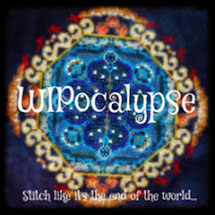 Just sign in every 15th with Mr Linky if you have stitched anything you consider to be a piece of Gifted Gorgeousness. Kaye asked if WIP photos are OK for the linky. Of course, WIP photos are an important part of the SAL! I don't know about anyone else but I feel more invested in someone's blog if they show regular progress pictures of their work. 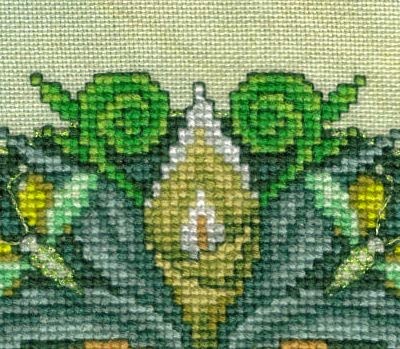 It feels like you are stitching alongside them rather than just admiring the finished piece. 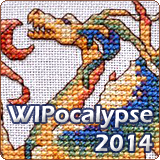 When it's been a big project I sometimes feel a little sad it is finished and we won't see another update! Finally, the dates for the Advent Calendar have been sent out. Watch out for the first post next week. 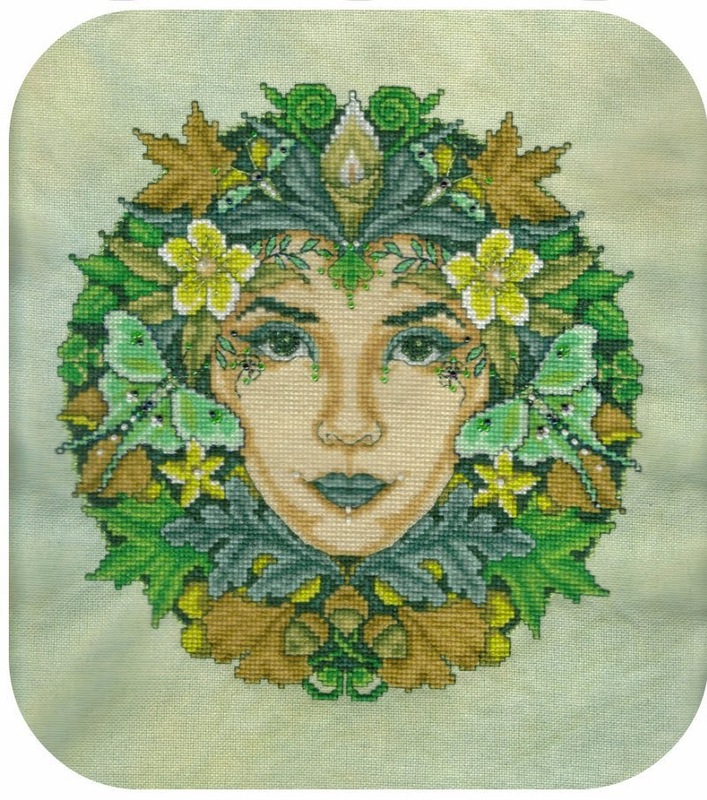 The Green, Green Goddess is Home! 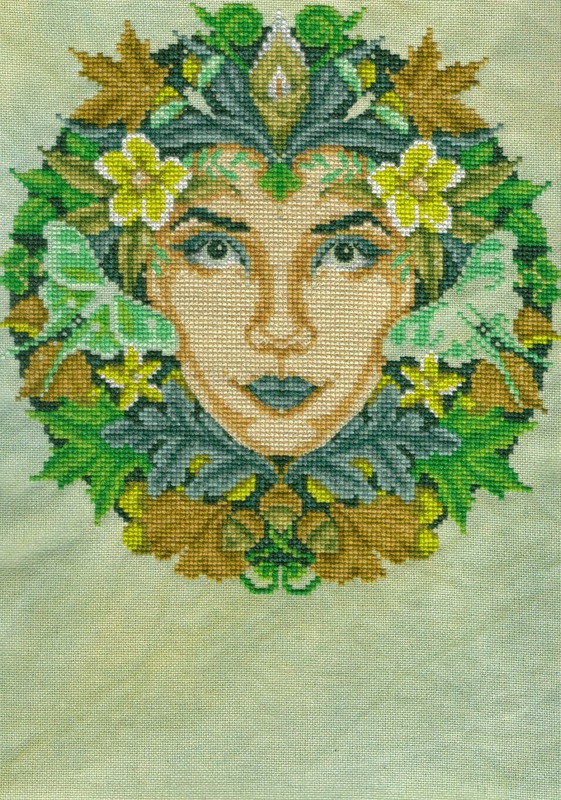 I know you have all been looking forward to seeing the Green Goddess finally finished and have been waiting very patiently for the final photos. I started her back in 2011 when I had a mere 100 followers. So if you remember her from the beginning you were one of them! I always intended her to be a gift for my Mum but she kept slipping down the list much to my regret. 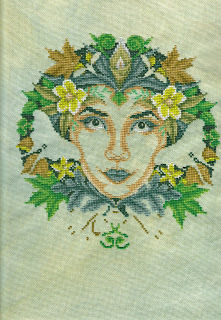 So with this year being a special birthday for Mum I thought I really ought to crack on and complete Green Goddess. Being me, I was still working on her the day before the Birthday, making French Knots in Kreinik. Yeah, Thanks for that, Joan Elliott! Changes - I smoothed her jawline as my Mum prefers that to the "stepped" look. 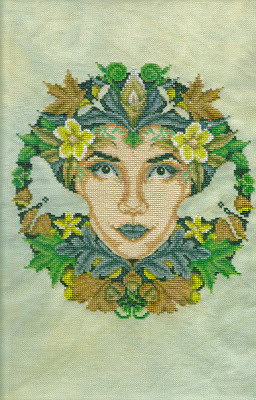 I left off the large square border as we preferred her as a circle. Trivia Fact - the fabric was a Ltd Edition which Dawn decided to add to the collection after I kept asking for pieces of it. She named it after part of my address. Finally - the reaction? Mum loved her! We gave her the boys' gifts first; smellies and chocolates (a very large box of Thornton's dessert chocolate, yum, and a box of Turkish Delight Thins because the Large Boy always eats the Turkish Delight from the mixed box so this box is just for her!). I had rolled GG and wrapped her like a long thin birthday cracker with ribbon at either end. Mum could not guess what she was! Now the big decision is how to frame her. As most stitchers know there are two types of Finishing. 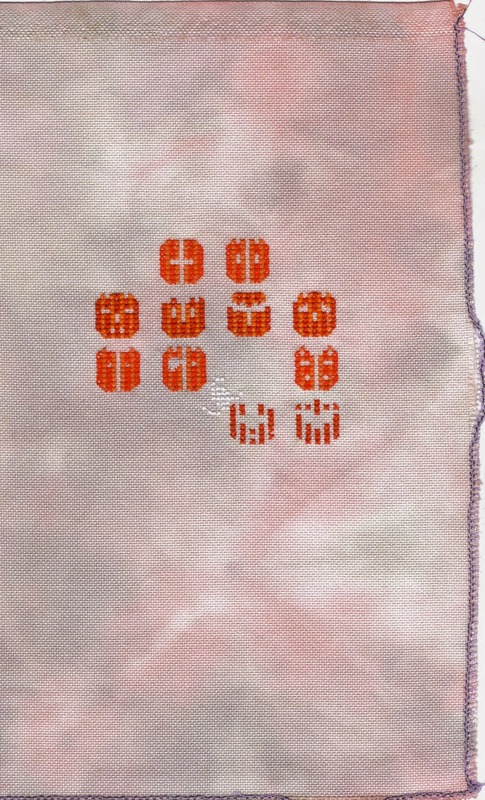 The first is the finished stitched piece, like the Eleventh Day shown above. All the stitching is done and it can be added to my list of finished pieces, currently at 51 pieces for the year. But what of the second type of finish? 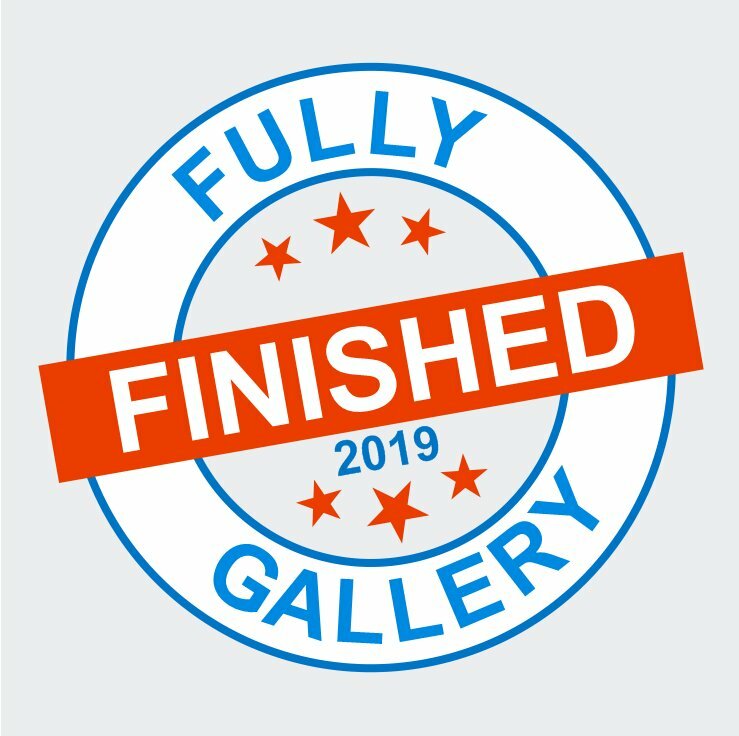 Actually "finished- off", whether that be framed, mounted or ornamentified? Sadly that number is much lower. 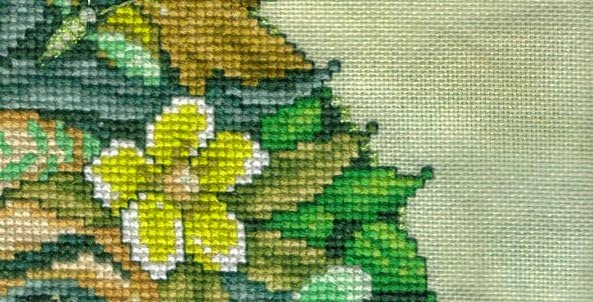 How many of us put our stitched pieces into a nice neat pile of "To Be Finished Properly Later"? I have to be in the right mood to do actual sewing so the pile of things I want to make into ornies is growing tall!! The new start you can see in the main TUSAL photo is Jack-A-Rachnid by Tempting Tangles from JCS Sep/Oct 2013. This has been on my list since I got the magazine and I am so pleased to be able to make a start on it. The fabric is a random 32 count linen from a Crafty Kitten grab-bag. It's a pinky-orange colour. These two tied for tenth place! The categories were interesting this year. I either liked none or several in a category! The red selection was interesting because I liked the whole page but when I came to choose I realised that there wasn't one which stood alone. It was the effect of all the red I liked rather than the ornies themselves! I also don't usually choose snowmen designs, but here they are - three of them!! I love the snowbaby putting the star on the tree, it would make a lovely Baby's First Christmas ornie. Finally, don't forget to read all about the Gifted Gorgeousness SAL and I now have enough people for the Advent Calendar Blog Hop! Yay! 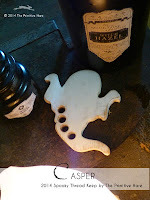 First of all, a request for more people to sign up for the Advent Calendar Blog Hop. All you have to do is make a blog post on one day during December which I will allocate to you. 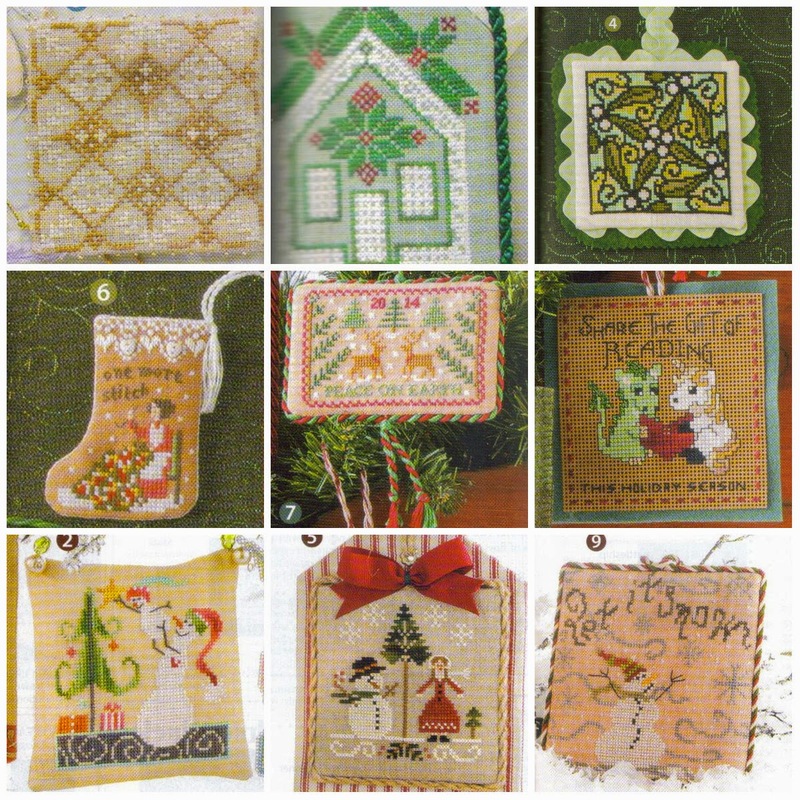 Show us some seasonal stitching on your day! This is the fourth year I have run the Advent Calendar Blog Hop and it is always the most popular post of the year so sign up and join in. Spent the last of the old Birthday money now! 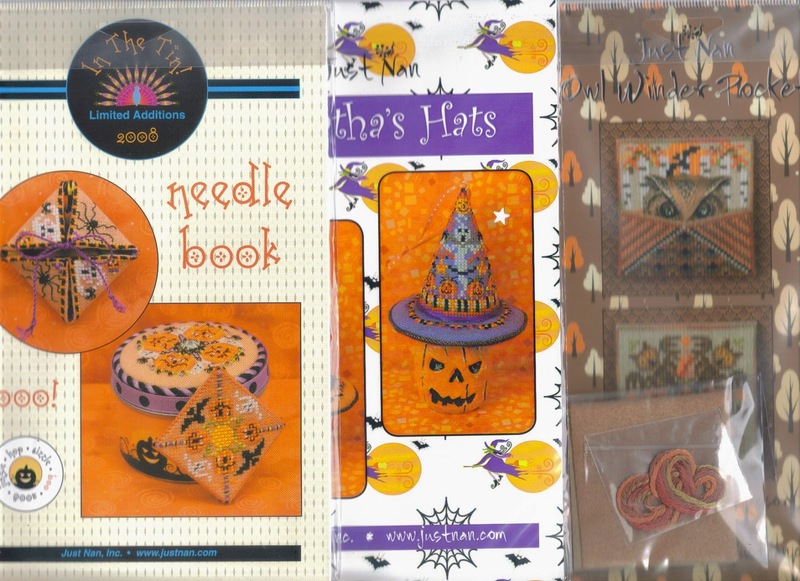 I made the terrible error of visiting a Stash Unload FB page and saw these three Just Nan kits, they don't include the thread or fabric but do have the embellisments and extra bits. 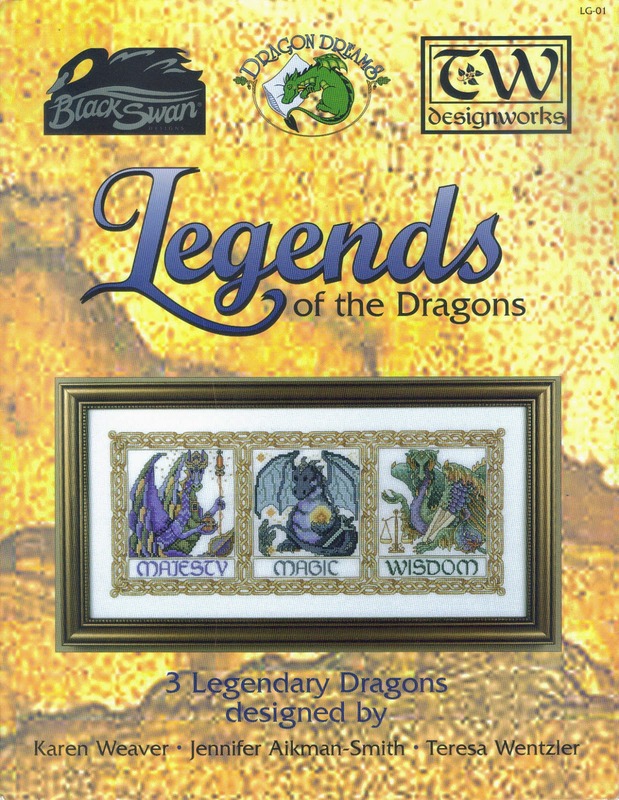 She was offering "free postage with four charts" and had this great Legends of the Dragons compilation chart with designs by Black Swan, Dragon Dreams and Teresa Wentzler. All four for £26 - bargain! Later on in the month I was browsing the SewandSo website for fabric because someone had mentioned they had a sale on. 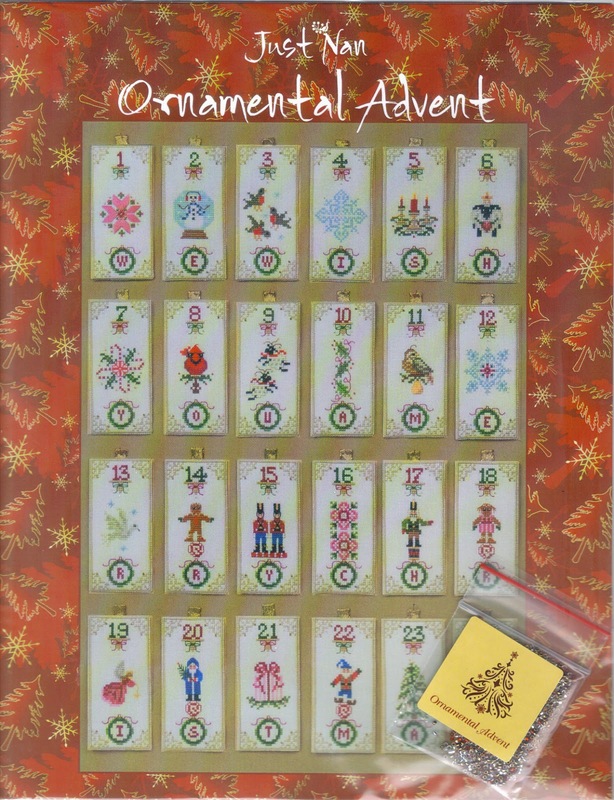 There on the very first page of the sale was a Just Nan chart from my Wish List - The Ornamental Advent, reduced by 50%! 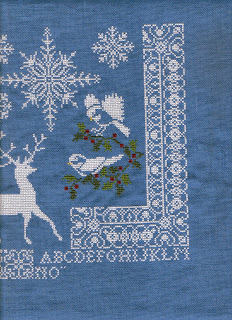 Last year I stitched the Little Stitcher Advent and showed them each day on my FB page. 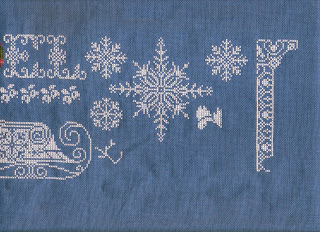 My Godmother "liked" and commented every day so I thought it might be nice to make her a stitched advent calendar too. Another project for next year! And while I was in the Sale page I noticed another JN chart, reduced by a massive 75%. Too good to resist! The pumpkin at the top is really dull! 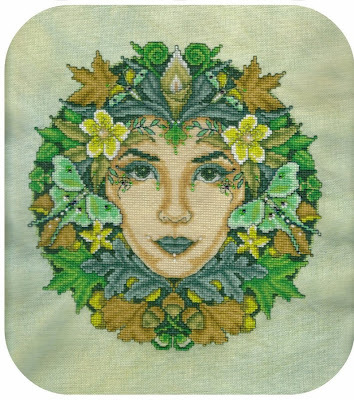 I will do a special post for Green Goddess at the weekend. 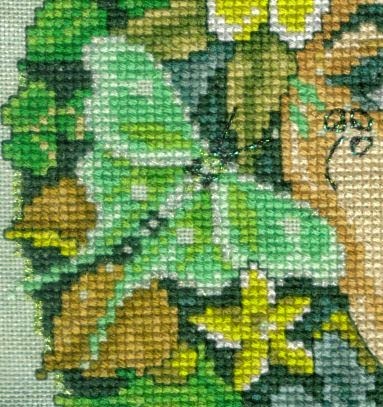 I have been stitching almost constantly on her and spending very little time online this week so I am miles behind on emails and blogs. One email I did take the time to read came from Gillie Random Thoughts from Abroad. She simply said "read my blog". Well, I was blown away by her blog post; not only does she love my idea for the Gifted Gorgeousness SAL but she has jumped right on board with a giveway of her own. If you sign up for the SAL and/or leave a comment on her blog post she will enter you into a draw to win 15 skeins of DMC. But only if you live outside the USA, the reason being she feels sorry for those of us who have to pay 90p or more a skein compared to the few cents DMC charge in the States. What a lovely lady Gillie is. The Gifted Gorgeousness SAL is a year long SAL I came up with to encourage people to share some of the beautiful charts they have won or been gifted over the years. It is a "drop-in" type SAL, you don't have to post every month, There will be a linky page on the 15th of every month so just sign in there if you have something to share that month. Full details and main sign-up page here. Finally, the Advent Calendar Blog Hop - I need more people!! We have just over half the participants now but need 24 in total. First of all, a piece of actual Gifted Gorgeousness and then an explanation of my latest bright idea! I recently send some aida off to a fellow stitcher as I knew I would not use it myself so it was nice to find a good home for it. Look what I received a few days later! Isn't it lovely? Now I am sure we have all benefited from the generousity of our fellow bloggers so here is your chance to show your appreciation for that generousness by doing what we do best - stitching and blogging about it! I have decided to host my first ever year-long SAL - the Gifted Gorgeousness SAL. This is a nice open SAL, not too many rules. There is a special page here for you to sign up on (if the Mr Linky works!) and link to on your own blogs if you like. So who is in with me? 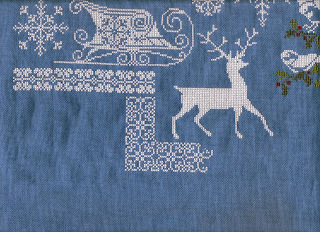 This week I have diligently been stitching something which fits in with the 7th category above, a gift for my Mum. I intended to give this to her when I first started stitching it. Fortunately I did not mention it at the time as I think she would have got rather impatient by now! Mum was always a strict OAAT stitcher herself. 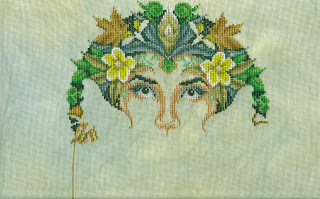 Anyway, Green Goddess is nearing completion so I won't show a whole photo, just a couple of sneaky peeks! Finally, the Advent Calendar Blog Hop will be starting on the 1st of December, same format as last year - sign up and be allocated a date. 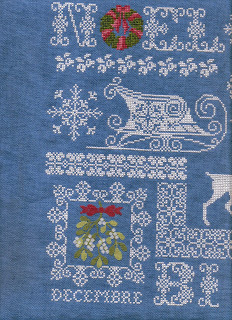 Post a stitched Christmas picture on your date plus a comment about the festive season. You can email me now if you like stating if you have a preference for an early date or later in the month or any dates you can't do. We have enough people for half the Advent so far which is great. Welcome back Green Goddess. 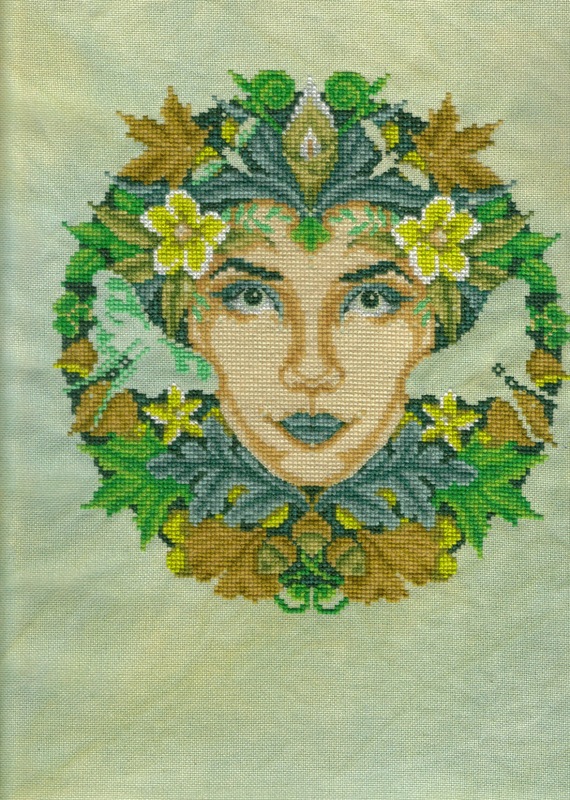 She was started way back in September 2011 and I stitched on her regularly for four months. Then didn't pick her up for an entire year! She featured a few times during the early months of 2013 and then nothing until this month. The rest of the moth on the left is all metallic as are the two dragonflies at the top. 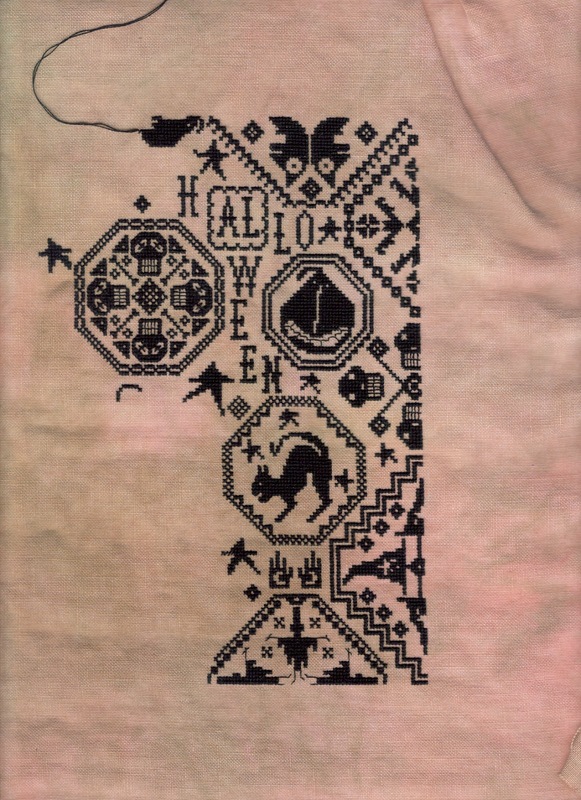 The second old friend is Prairie Moon's Thine is the Trick and the Treat. I started this one in September 2012, put it away after Hallowe'en, got it out in September 2013, put it away after Hallowe'en again. It will now take the place of Noel Blanc as my bath-time piece. Hopefully the one-length-a-day approach will see the same steady progress and a finish before next Hallowe'en. This is a hand-dyed 40 count fabric which was a gift from Karen. 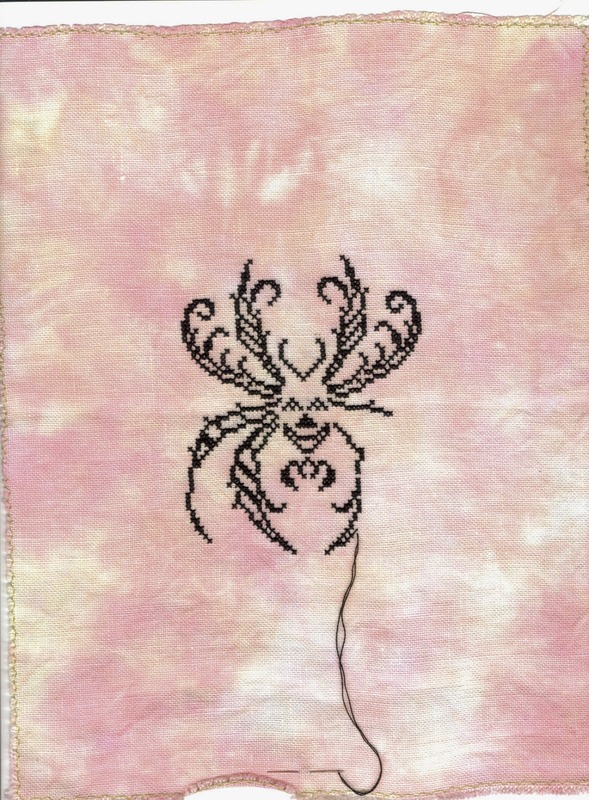 I am stitching with two strands of DMC310 which gives a lovely dense coverage. I am sure that you are all waiting for the results of the Hallowe'en Trick or Treat Mystery Phrase Blog Hop? The answer was, of course, Pumpkins & Black Cats. Which did feature on a number of the designs. I picked two names at random. Each picture poster got one chance and each correct answer got one chance. So if you did both then you got two chances to win! Congratulations to both of them! A little something will be finding its way to you in due course. Finally, the Advent Calendar Blog Hop will be starting on the 1st of December, same format as last year - sign up and be allocated a date. 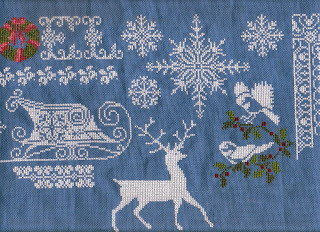 Post a stitched Christmas picture on your date plus a comment about the festive season. You can email me now if you like stating if you have a preference for an early date or later in the month or any dates you can't do. I'll be posting about it regularly and adding a logo soon! Ohmygosh I actually stitched on her!! That bright green in the left hand moth. This has been an ongoing project since December 2013. I stitch it each evening while I am supervising the Small Boy in his bath. Some nights I get a whole length of thread in, sometimes two, sometimes a few stitches and he wants out. But slow and steady has done it! Here is a close-up of the wreath that delayed the finish. 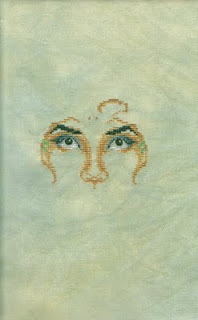 Although it looks OK in the scanned photos in real life the greens just did not stand out enough against the blue fabric. 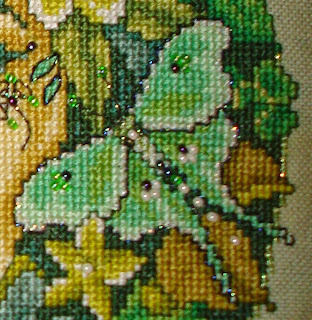 So I frogged and stitched in lighter greens. 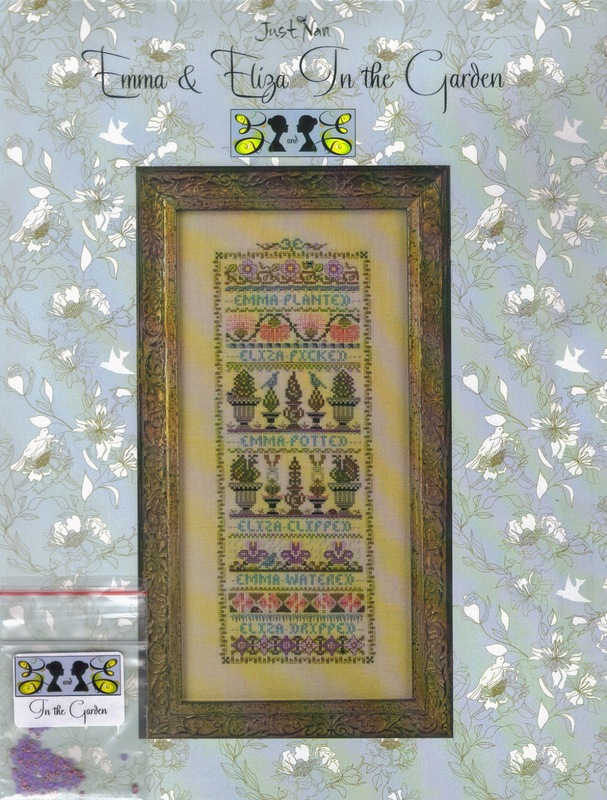 I won the chart in a giveaway by Kathy Ellen of A Stitcher's Heirlooms quite some time ago! 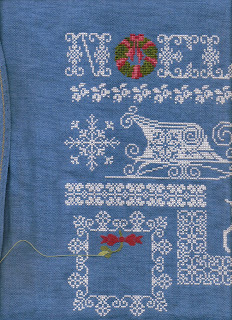 It has been lovely stitching on it each day and thinking of our friendship across the miles. 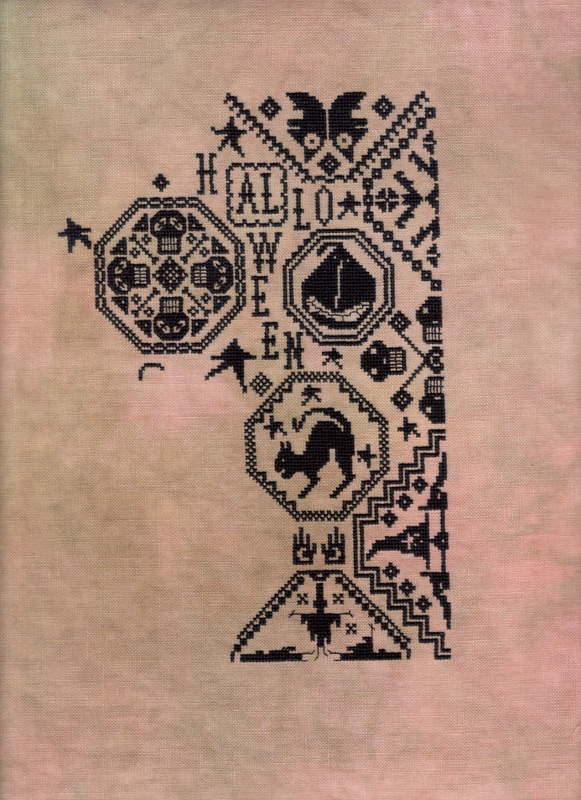 And now the chart will be travelling on to Kaye in Australia as I promised it to her once I finally finished it. 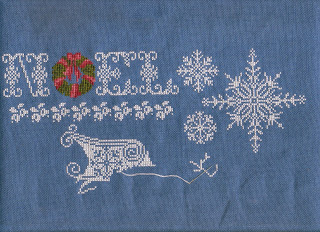 I have stitched at least a quarter of this one so it should be slightly quicker than Noel Blanc. Maybe eight months? What are your favourite and least favourite materials to use in your stitching? My favourite fabric is evenweave, with my favourite count being 32 count. I like stitching on Murano for picture designs. 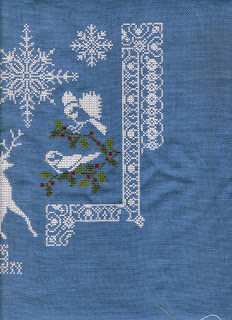 For samplers I enjoy linen, again in 32 count or higher. I am a big fan of hand-dyed fabrics, the majority of which I get from Dawn at Crafty Kitten or Kate at Sparklies. They are both lovely people and sell the most gorgeous fabrics. Dawn's tend to be more subtle and muted whereas Kate's are more variegated and brighter! Both will mail internationally so please check out their websites if you haven't already done so. Thread-wise I am a DMC fan, for price, availability and consistency in colour and quality they can't be beaten. I have used silks and while I like them I am not totally convinced they are worth the extra expense! My least favourite items would be a tie between hard aida and bobbins! I know these are both contentious subjects but honestly - life is too short to bobbinate!! DMC comes in the perfect skein already so you can just pull out one length or two. Why spend valuable hours unravelling it and putting it on a bobbin? And don't get me started on the horrible cheap hard aida they supply in some kits. I actually got a friction burn from one piece where it rubbed against my wrist! I don't use many tools. I stitch in hand so no hoops or frames. I railroad my stitches so I don't use a special laying tool. I would rather like a Star DeTailer thingy to hook in the last mm of the thread but they are expensive to import so I do without. Nice sharp scissors are a must and I do like gold plated needles too (size 28 petite). I use Flossaway bags to store my threads and make thread sorters out of cornflake packets, although I have a craving for the Primitive Hare witch and ghost! An ORTs tin and a stitching project bag and I'm good to go! 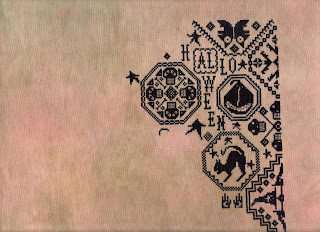 Finally, the Hallowe'en Trick or Treat Blog Hop ends at midnight tonight and the winner will be announced this weekend (probably Sunday) when I will also post details on the next hop - The Advent Calendar. I am also contemplating a year long SAL on the theme Gifted Gloriousness. So think on that until then!